Before Christmas I started reading Les Mis. As in the complete unabridged version. A very daunting undertaking. I'm not a reader. And that many pages makes me laugh because I know that I'm a chronic don't-ever-finish-a-book-I-start kind of reader. And to be honest... I haven't read a new page once since before Christmas... BUT -- I AM going to. Because although I haven't even gotten through the introduction to the bishop, I'm loving it and feeling so inspired. I'm glad I'm reading it on the ipad, because I highlight and underline so much and then can easily find it later. Such rich rich stuff. I don't know a thing really about Victor Hugo, but this book makes me love Jesus more. These words mean a lot of different things to me -- but I want to hear what these words are speaking to you? What do you think? Does it fill your heart like mine? Oh my gosh how beautiful. And like you said, in so many ways. This makes me want to read Les Mis. I've been "starting" to read unabridged Anna Karenina since before Christmas. Maybe we should keep each other accountable? haha. that is beautiful - so well said. have u read the hunger game series?? i am not a reader either, but i can't put those down! oh yea girl... i can read some teen fiction in a flash! haha! 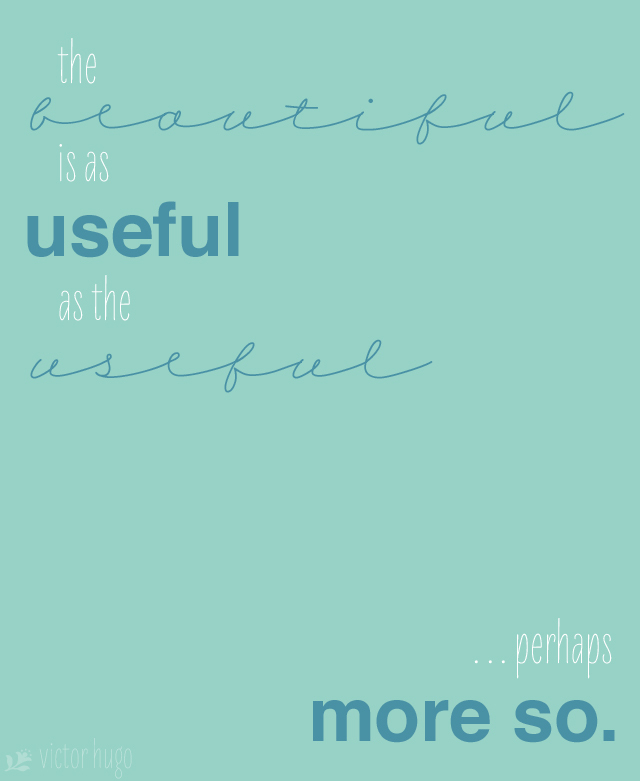 i love this quote and i think it helps me with my etsy shop-- creating beautiful things for others. or my love for anthropologie store displays. they could be silly things, but they are beautiful things that help me see life more fully. Anne Shirley of Anne of Green Gables was my hero growing up because she was passionately insistent on the same key theory as the quote above. Everyone in my family is all too practical and "useful", but as the lone writer and artist the beautiful becomes everything. This too makes me want to read Les Mis. I waded through Anna Karenina last year and it turned into one of the most fantastic things I've ever read. But Les Mis, like Ms. Karenina, definitely seems like a wintertime read. Perhaps next November! I am reading this book now to - the unabridged. knowing the history of the bishop and his heart makes Jean Valeans transformation even more beautiful. and you can just tell they know Jesus by how they shine in a dark world. so glad you are reading this book. i am in love with it!